Have always loved this serigraphie illustration "Desert plants landscape" by Laura Garcia Serventi of Art and People out of Brooklyn. Laura explains in the listing that the illustration was inspired by a trip to Mexico. 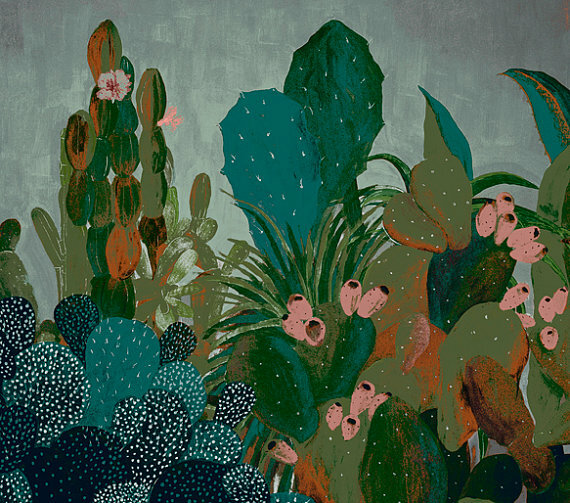 We love the dense landscape of succulents, cacti and abundance of prickly pears she created in this screen print and gouache piece. Laura also designs custom wedding invitations and party invites. See more of her work in her Etsy shop here.